On Monday morning we are surprised by the number of cars around us. There are cars parked on both sides of us even though there is plenty of room for them to park in other spots. We are excited about the drive today because we are on the home stretch to reaching Quartzsite. The drive takes us over lots of varied terrain and we see some gorgeous landscapes. 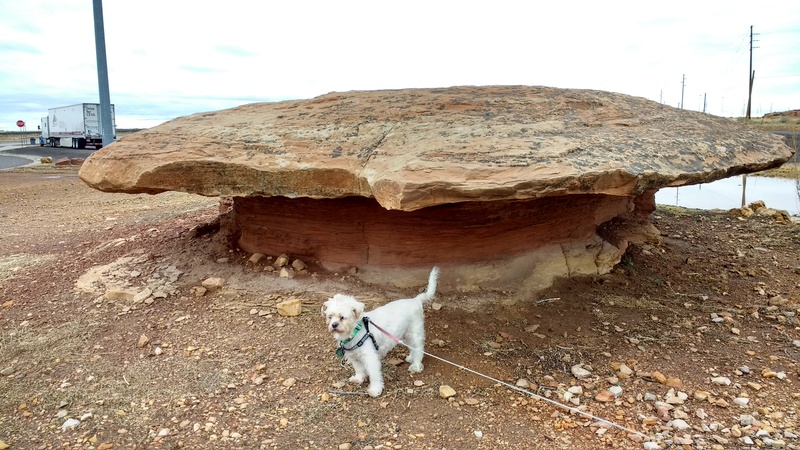 We stop at the Meteor Crater Rest Stop which is pretty awesome and is surrounded by several interesting rock formations. Since it wasn’t frigid cold or rainy, we take a nice walk with Heidi. Heidi finds the rocks interesting. 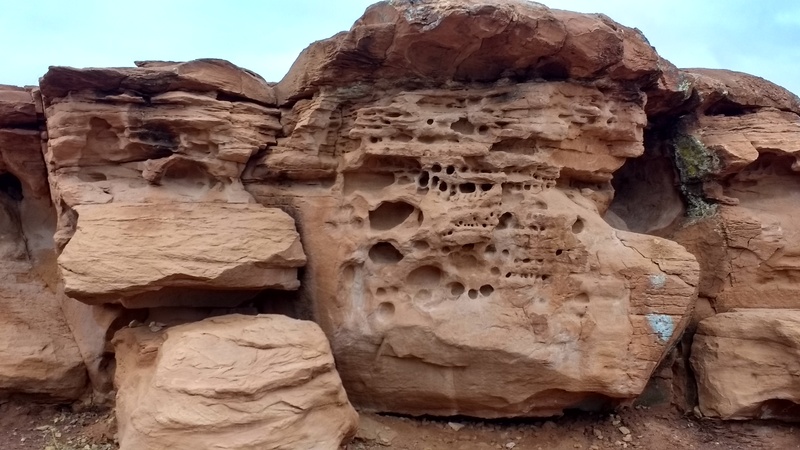 Another interesting rock formation. Notice the pits from the wind and rain. Back on the road again. Finally we say goodbye to I-40 and head south on I-17. Then we start climbing a mountain range as we pass through Tonto National Forest. We had been seeing snow covered peaks for quite a while and the sun was peeking through the clouds making some of the mountain peaks glisten. As we climb, the engine groans and sputters when we pass 7,000 ft. During the climb, I install an altimeter app on my phone. It turns out the app is extremely accurate! 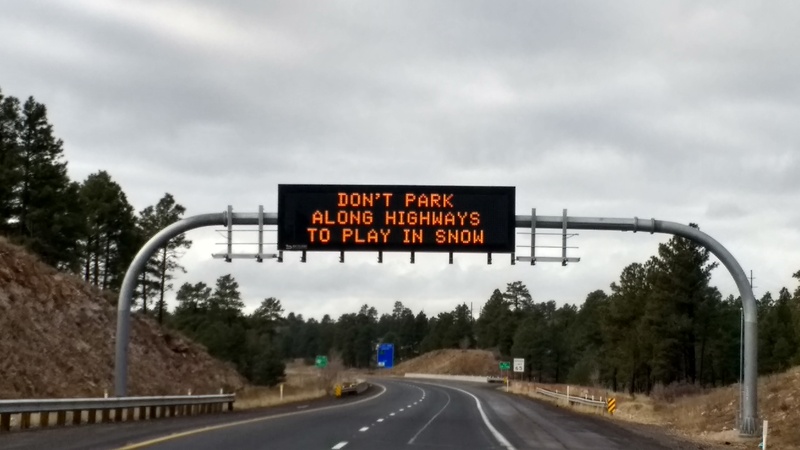 Obviously that snow sign isn’t meant for us .….we want to run away from it, not play in it! Upon descending the mountain range we begin to see the Saguaro cactus. We see several other species of Cacti as our elevation continues to lower. We also notice the temperature is getting warmer. We are getting closer to our destination. We stop in the town of Anthem to get a few fresh food supplies. This is the biggest town we are passing through before Quartzsite. Now the weather feels like a warm spring day, it is sunny and 65 degrees. 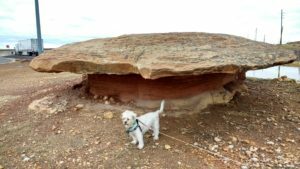 We head out the last leg of our trip to Salome, Az where we decide to stay at the KOA so we can un-winterize and take a long luxurious shower in the bathhouse. The road leading to the campground is scenic with mountains on both sides and large expanses of flat lands and brush with cacti. This road is called “Carefree Highway”, yes just like the song! How appropriate! We arrive at the KOA which had great reviews, but is basically a big gravel lot with stanchions. We wanted a campground with full hookups to make the un-winterizing task easy. After un-winterizing we planned on enjoying a leisurely and relaxing evening. When I went to get the key to open the hatch where the electric cable and hoses are kept, I couldn’t find the keys. I immediately went into a panic as I searched everywhere. The last thing I had done before we left home was to change that lock. Almost all campers have the same key for their hatch locks and we wanted that compartment to be more secure. I had not yet put the keys on our rings – and yep you guessed it, both keys were together! Kathy and I tore the camper apart looking for the keys. The last time I had the keys was two nights ago at the Texas Welcome Center when it was freezing rain and I was getting the ice scraper out of the hatch. The keys may turn up or they may be lost forever. After an hour and a half we went to the office and they called a maintenance man over. He came over with his key ready to unlock our hatch and then saw that our lock had a cam style key. He tried a cam style key but it didn’t fit. There was a bit of play in the hatch door and he said he would try to pull it sideways and out if we were okay with that. One tug and the door popped right out! We got our electric hooked up, but delayed the winterizing. So much for a leisurely evening! This entry was posted in Arizona and tagged Quartzsite, Tonto National Forest. Bookmark the permalink. Some folks consider the rugged west and its deserts a barren land; however, it definitely has its own beauty and I know you two will see and appreciate it. I hope you will be lucky enough to see the desert in blossom. When I lived in San Diego, I would travel to the Anza-Borrego Desert to see the beautiful blooms on the cacti and other desert plants. In San Diego, there was a phone number to call that had an announcement of when the desert plants were blooming. I believe the bloom was most often in February, but could vary depending on rainfall and temperatures. I’m sure Park Rangers can give you more information. Safe travels on this great adventure. We would love to see the desert in bloom. We’ll be sure to check it out. We love the openeness of the desert and seeing the mountains in the distance. Having lived in San Diego off and on for ten years with the Navy…I used to camp in the Anza-Borrego Desert. Agree with Carol’s comments…find out when the desert flowers are in bloom….and they should be spectacular with the rain fall amounts this year…and then plan a trip to seem them…Anza-Borrego State park has some nice campgrounds…which fill up quickly…but there are some first come-first serve…then continuing on to the Chula Vista RV Resort to spend some time in San Diego. Wow two tips on seeing the desert in bloom. That is a must on our agenda. And we hear that Chula Vista RV Resort is a pretty awesome place! We look forward to hopping on those Costco paddle boards and flying our Rev kites on the beach with you guys.